Another cold windy day in the deer woods was on the agenda with expectations nearing an all time low. So far my archery season was a huge disappointment in terms of total number of deer sightings overall and my own performance when opportunities arose. Almost two weeks into the regular firearms season having yet to see a single buck. I was beginning to feel as if I were just going through the motions, but still unwilling to accept defeat due to lack of effort. As is the case, I am in essence only an avid meat hunter that finds great satisfaction in taking a nice doe or subordinate buck that others may not find as much a sense of accomplishment in as I do. To me that's the beauty of deer hunting is no matter how low you set your standards, the posability always exists for any hunt to become the trophy hunt of a lifetime at any moment. Earlier in the day I was feeling pretty good to have spotted six antlerless deer across the road from me on the mornings hunt. I had to pass on a golden opportunity for a mature doe as she stood in a safe zone 50 yards across the neighbors posted property where hunting is not allowed. I decided this afternoon to make my way to higher ground behind the house, if for nothing more than the anticipation of checking my trail cameras. Forty-five minutes to the top, I reached my first cam set and pulled the card to reveal what I'd become so accustomed to already expect...nothing. I figured the high winds and wintery weather had kept deer movement to a minimum during the overnight in an area where they had already been pressured hard and perhaps maybe even evacuated at this point. Without seeing any fresh sign up to now in the six inches of fresh snow we received, my hopes were just to fight off the wind and cold long enough to finish my rounds and check my other two cams around the perimeter of the propperty. Half way between my first and second cam sets I stumbled upon a few sets of fresh tracks working their way through the hemlocks. My mind drifted to a family group of does and fawns using this cover to escape the elements so I worked my way to a stick blind I had not far from here. Once at the blind, I hunkered down in hopes of spending the last 3 hours of daylight in an area that showed the most promising sign to fill my doe permit. The sit was a short lived one hour as the wind cut right through me once I stopped moving. I strapped my pack back on, grabbed my gun and decided to hit the other two cams and work my way home. If all went according to plan, I should arrive just before dark and maybe catch a plate of hot dinner before feeding time was over. I made my way around the green field and noticed the deer had been using it the night before. My cudde (trail cam) was close, and my excitement level grew as I neared the set. Unfortunately, it was no surprise when I got there that they had eluded that cam too...I had one more to check with 2 1/2 hrs of light left so away I went. I made my way through another dense set of hemlocks. This patch was full of fresh tracks as well as fresh beds, but the sight of running deer tracks leaving the cover quickly snapped me to the reality that I had already spooked them out without ever getting a glimpse of one. With my head hung in dissapointment I got sidetracked following the tracks to see that they ran off in a circle back from where I had just come from. For kicks and giggles I'd poke around in here for a while to see where they have all been hiding and maybe understand things a little better. After an hour or so I'd seen enough and headed off to my last cam set about a 1/4 mile away. Giving some serious consideration to just skipping this one and taking the straight line back downhill towards home sounded like a much more pleasant experience at the time but I was really doubting I'd find the drive to make the return trek the following day. At least now I would know all my batteries were good to go until I found my way back up here. At some point my mind just began to wander about other things non-hunting related including where the heck I was heading. When I snapped out of it and looked up, the snow covered woods I was looking at before me wasn't farmiliar at all........brain fart,lol. I stood there like an idiot for a bit trying to regain my berrings, after I had not hit the trail I was looking for in quite a while. I finally recognized a distant hillside and cussed myself for being so unobservant......it was no wonder to me I was having such a hard time killing a deer this year......geeze. In the homestreach now, having reached the trail I was looking for, I only had two more ridges to cross to get to the last cam set. It wouldn't be long now...I wonder what was cooking at home, I'm getting pretty hungry. Turning back uphill to come to the head of the ravine was going to be a lot less work than cutting straight across the 60 foot plunge, so that's what I'll do. My pack and gun were gaining weight and my body was starting to feel the aches and stiffness setting in from the long walk about with all this gear. Just before hitting the top of the ridge off to my left down in a briar thicket I noticed a deer browsing along, nipping the ends off branches overhead. Now I'm pumped! This dumb deer was only 40-50 yds away and had no clue I was there watching it. There was just too much crap in between us to get a good look at what it was, but I could have swore I saw some antler flash through the brush. I shouldered the muzzleloader and peered through the scope which was set at 4X power. Holy moley! It was a buck for sure, but I still have no clue as to how many points he had or how big it was yet. That's ok....he's working his way out of the thicket heading uphill and would be in the clear soon. Anticipating the upcoming shot opportunity that was about to unfold, I checked to make sure my safety was on and then proceeded to pull the hammer back. Like something from a bad dream.....my hammer was stuck...it wouldn't pull back...What the hell was going on? I looked up and saw the buck in all his glory for the first time. A wide beauty slowly making his way along. Back to my gun. I quickly opened the break open action and checked the primer for some reason, then cracked it back closed and got the hammer back for good. Apparently I didn't have it locked closed, thus preventing me from cocking it. Now my buck was in the clear, my gun cocked, and my crosshairs settled on him standing statue still in a perfect shot scenario... I couldn't possibly ask for better. I calmly clicked the safety off and it was show time! 1-2-3....BOOOOOOOM!!! I could see right through the smoke like never before as the beast went from 0 to 60 in an instant. Not far into his escape dash he slipped to the ground, but quickly regained his feet and sped out of sight just over the hill. All of a sudden, I got distracted when another beautiful buck emerged and staired off in the direction my buck had run. Together, we both stood and listened to my buck crash. I watched as the other buck slowly made his way down the ridge seemingly without a care in the world about his friends demise. Not wanting to take any chances of following up unloaded, I ran a few patches through my barrel and loaded up another round before taking up the trail. As I'm swabbing the barrel, movement catches my eye and another one horned spiker is trotting in to 20 yds before stopping to look off in my buck direction... trying to figure things out. I could only smile and take it all in at this point. What a freaking hunt this had turned out to be on a hunt that almost didn't happen. I ended up shooing the spiker away and headed off to follow up on my beasty. 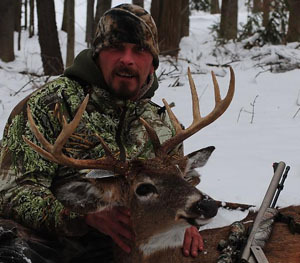 At the top of the ridge lay success in the form of a magnificant 19 inch wide 11 point buck that left me breathless. All I could do was sit on the ground beside him and admire what an incredibly impresssive creature he was dead before me as he was just moments before in life breathing the same air as myself. A quick thank you to our common creator was first and foremost even though I'm not much of the religious kind...it was obvious at this point there was no denying what God had planned for this glorious day where hunter meets the hunted. The drag home was a long one but I managed to cover the ground quickly and return just after dark. Probably would have gotten there a lot sooner, but I couldn't help but to stop a few times and look back at my trophy leaving the bloody skid marks in the snow behind me!